The panel painting, entered by an American collector, has not been seen at auction since 1996, where it failed to sell against a low estimate of $6 million at Christie’s New York. It is one of two works in the 42-lot auction that has been guaranteed a minimum price through a third-party “irrevocable bid.” The low estimate is 12 million pounds, said Sotheby’s. The 45-year-old Picasso met Walter by chance in 1927 when she was leaving the Paris subway. 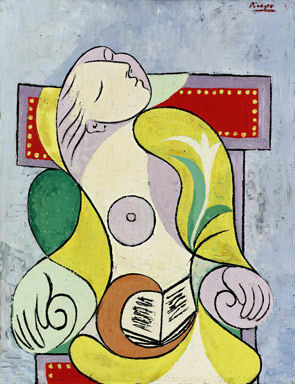 “He simply took me by the arm and said: ‘I am Picasso! You and I are going to do great things together,’” said Walter in an exhibition catalog. Walter was 17 at the time. She remained the mistress of the artist, who was married to Olga Khokhlova, from 1927 to about 1935. Sotheby’s London auction also includes a 1923 head-and- shoulders portrait of Khokhlova, valued at 1.3 million pounds to 1.8 million pounds. Last February, Alberto Giacometti’s 1961 bronze “Walking Man I” fetched an artist record 65 million pounds (then $103.4 million) at Sotheby’s. The following June, a Claude Monet “Nympheas” painting failed to achieve an ambitious estimate of 30 million pounds at Christie’s. Giacometti’s 1957 bronze, “Grand buste de Diego avec bras,” is estimated to fetch between 3.5 million pounds and 5 million pounds at Sotheby’s this February, while Marino Marini’s 1955 sculpture of a mounted horseman in the same medium, “L’Idea del cavaliere,” is valued at 3.7 million pounds to 4.5 million pounds. The estimate for the Marini reflects the artist record of 4.5 million pounds paid for another sculpture at Christie’s Frieze Week auction in October, said dealers. Sotheby’s auction carries a low estimate of 55.6 million pounds. The equivalent event last year carried a minimum valuation of 69 million pounds. Buyers will have a further 23 Impressionist and modern lots to choose from in the company’s “Looking Closely: A Private Collection” sale on Feb. 10. The works, including Salvador Dali’s “Portrait de Paul Eluard,” are estimated to raise at least 23.4 million pounds in total. Paul Gauguin’s 1901 Tahiti-period painting of sunflowers in a vase, “Nature morte a ‘L’Esperance,’” valued at 7 million pounds to 10 million pounds, is the main highlight of Christie’s rival sale on Feb. 9. This 78-lot offering is expected to raise at least 73.9 million pounds, as against 56.5 million pounds last year.